Breakthrough is part of the Building Better Opportunities Programme. Funding from which supports projects in England that tackle poverty and promote social inclusion. Funding: Breakthrough is jointly funded through the European Social Fund and Big Lottery Fund and received £1,232.300 for delivery between September 2016 and March 2019. View the latest evaluation information. Led by the Nuneaton & Bedworth Citizens Advice Bureau working collaboratively with a range of partners across Coventry and Warwickshire. Breakthrough is focused on providing targeted support to overcome and tackle poverty and promote social / financial inclusion for those with greater and more complex barriers; who experience multiple disadvantages. Offering free ongoing support for those individuals who are either unemployed or economically inactive to help them overcome their everyday problems and barriers, adapt to change and gain skills that boost their self-esteem, confidence and wellbeing. Each client has a dedicated Money Mentor to ‘come alongside’ and provide advice and to support them through their journey to help develop a personalised action plan; and oversee their progress through the Breakthrough Programme. Since September 2016 we have offered advice and guidance to over 1000 clients, with 480 of these progressing onto the programme in full and receiving 1-2-1 mentoring. To date 27% of these clients have left the programme and gone into training or education, with a further 35% starting work or entering job search following periods of economic inactivity. 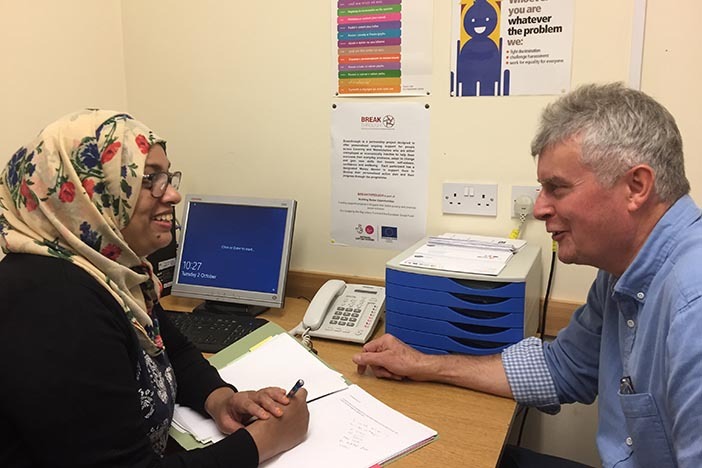 Our ongoing evaluation run in partnership with colleagues at Birmingham’s Aston University shows significant positive impacts on participant’s financial, emotional, physical and social situation, with almost universal praise for the work of the Breakthrough mentors across Coventry and Warwickshire.